To view this Backgrounder in Portuguese, click here; to view in French click here. The following is an excerpt from our latest Dismantling Racism in the Food System Backgrounder, and is from 2017’s forthcoming book Land Justice: Re-imagining Land, Food, and the Commons. Click here to download this Backgrounder in full. Much like the Mende song, African agrarian roots have survived through the memory and practice of a deep enduring connectedness to the land. Today, there are Africans in America who have been rooted on family land for over 150 years. 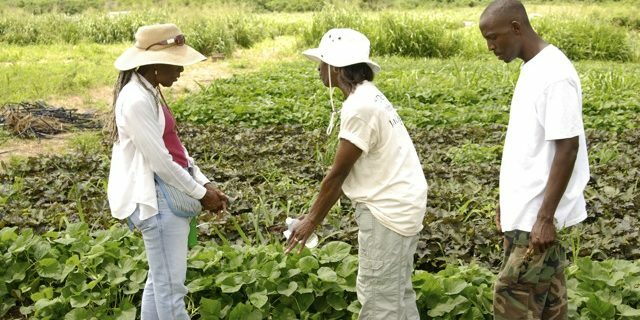 Many Black landowners are struggling to retain their land, agrarian roots, and memory of communal beliefs about land ownership and caring for nature. There are African farmers and landowners in America still surviving, like “Amelia’s Song,” but they are threatened by a hostile food and agricultural system, discriminatory government policies, and a swiftly moving tide of urban and rural development. Click here to sign up for more information on the forthcoming book from which this Backgrounder is a part of, Land Justice: Re-imagining Land, Food, and the Commons.